In 1986, OGAWA co-founders Mr. Wong Lee Keong and Ms. Lim Poh Khian started up Morwell Sdn. Bhd. Thus began their enterprise into the trading of household and electrical products in Malaysia. Mid 1996, saw the enterprising duo venture into the health and wellness equipment market, simultaneously creating Fujiiryoki, formerly known as Healthy & Nice Sdn Bhd. This was then the beginning of the venture into the brand name OGAWA as former business ventures also adopted a similar strategy. It was Mr. Wong and Ms. Lim’s vision in product design and brand development that formed the brand name OGAWA and the subsequent boom in business led to the creation of Healthy World in 2001. This strategic formulation was in line with the business strategy of strengthening the OGAWA brand name in the health and wellness equipment industry, locally and abroad. Today, Ogawa World Bhd has successfully introduced various innovative designs under the OGAWA brand name. OGAWA is today’s leader in the health and wellness equipment market, in Malaysia and throughout South East Asia. A massage chair can provide relaxation and pain relief when an individual is seated in the chair, and has a plethora of health benefits. Sitting in a massage chair can increase circulation, relieve stress, and improve mental health. However, with so many products on the market, it can be difficult to know which one to choose. 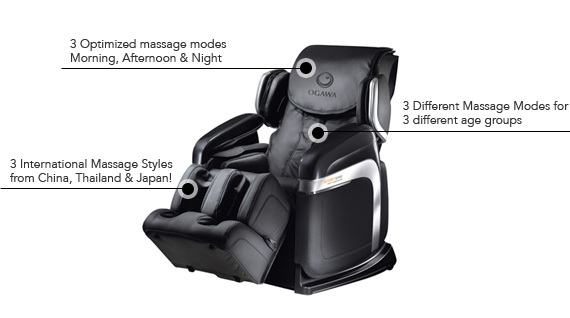 Ogawa massage chairs provide comfort and relaxation, and utilize the latest technology. Here are just some of the benefits of these massage chairs. Ogawa massage chairs provide the recipient with comfortable vibrations on the head, torso, legs, and arms. Chairs manufactured by the company can be adjusted prior to the massage so that you feel completely comfortable. These type of chairs can be used by people of all ages, and can be used on a regular basis to help with joint tension or aches and pains. The chair itself can provide full support for the head and body, and can much more comfortable than a regular sofa or arm chair. It has been designed in a way to enhance comfort at all times, and can be purchased in a wide range of different colors and styles, including the Smart Crest, Smart Delight, and Smart Delight Plus. According to the Workplace Wellness Magazine, many people prefer massage chairs to other types of massage because they can stay dressed at all times when on the chair, which can eliminate the fear of being undressed among a stranger when having a conventional massage at a parlor or beauty treatment center. The magazine also notes how remaining dressed can have an impact on how individuals perceive massage, which in turn can enhance their relaxation and comfort. Ogawa massage chairs specialize in massage chairs of the highest quality, and have a number of products on offer including remote control-operated chairs, and chairs with foot rollers and air bags. The air bags are capable of giving the calve muscles a massage, while foot rollers target pressure points in the feet. People who suffer from stress are encouraged to use a massage chair manufactured by Ogawa to loosen the muscles and provide a general sense of wellbeing. Massage can increase serotonin in the brain, which can make people feel good when they are having a massage. Stress can often tense up the body and cause aches or pains if not dealt with properly. A massage chair can counteract this, and provide temporary pain relief, as well as helping with nervousness, depression, or headaches. Ogawa chairs can even promote a better quality of sleep – ideal for people who find it hard to get to sleep or wake up during the night. Many people have noted that they experienced a better night’s sleep after spending time in a massage chair. Regular massage can also provide you with a boost of energy – beneficial if you feel lethargic or tired during the day. Massage can help to reduce the symptoms of a number of health conditions, such as joint pain, muscle aches, arthritis, and high blood pressure. Sitting in a massage chair manufactured by Ogawa can have a similar effect, and can help to provide relief for the entire body. People who suffer from muscular tension – which can often lead to chronic pain – might find it beneficial to use a massage chair on a regular basis. Other benefits of these chairs include increasing the body’s immunity to flu and colds, and flushing out toxins which have built up in the body. The chairs can also be useful for those who suffer from depression, as regular massage can encourage the brain to release ‘endorphins’ – also known as the body’s ‘feel good’ chemical – into the bloodstream, which can promote a feeling of relaxation and general well being. Athletes will often experience all the benefits of massage after playing a sports game or spending time training in the gym. Massage can help to relax the muscles, and prevent aches and joint pain from developing. An Ogawa massage chair can have a similar effect, as the vibrations in the chair work to target different muscle groups and areas of the body. Sitting in the chair after spending time in the gym or undertaking an exercise class could also be beneficial, and can help the body to repair much more effectively and in a quicker time frame.